Flip-up downspout extensions are better for the environment than standard downspout extensions, because they are less likely to be damaged; therefore they need to be replaced less often. By being able to keep the downspout extensions out of the way for mowing, landscaping, and working around the house, they stay safe from damages. Fewer replacements means fewer materials used in the life of the project. 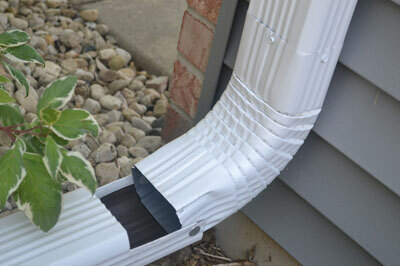 SnapLOCK gutter systems fasten flip-up downspout extensions better than screws or rivets, which is good for the environment. When using screws or rivets, they will wear out after repeated use, requiring future replacement of the fastener, and possibly the downspout extension. Since SnapLOCK gutters are made of aluminum and nylon for durability, they will not wear out, creating a permanent flip-up solution.